You think Survivor is a reality show, but it’s in many ways actually a sport—and former professional athletes have not been very good at it. The only former pro athlete to win the show was Ethan Zohn, perhaps generously labeled a “pro soccer player” although he only played a single season with the Highlanders FC in Zimbabwe. He almost shouldn’t count, if we’re tracking the Survivor records of former pro athletes. Brad Culpepper, on the other hand, spent nine years in the NFL as a defensive tackle, mostly for the Buccaneers, sandwiched between one season with the Vikings and one season with the Bears. In 1991, his senior year at Florida, he won an SEC championship ring and was first-team All-SEC. His dad was a Gator too, from 1960 to 1962. And Culpepper, in his second try on the show, could win this thing. The season finale is on Wednesday night and Culpepper has made it to the final six. Three more will get voted out, and the final three will head to a final tribal council where they plead their case to the jury. Who cares, though? you might say. Survivor isn’t about scripted drama or catty gossip. It’s a 39-day chess match, and it’s grueling. The castaways are dumped on an island and have to live off what they fish and hunt (plus a lot of coconuts, usually). There are no creature comforts until much later in the game if they’re lucky enough to win them (spa day; cookout; pillows) in a reward challenge. Medical help is nearby, but usually appears only in an emergency, and there have been many: players are semi-routinely evacuated from the island due to heat stroke, infections, broken bones and the like. In a recent season, one woman, Jen Lanzetti, got a bug inside her head and described “hearing his little legs crawl around in my head like it’s digging deeper into my ear canal.”Finally, at the end of the episode, the camera caught the bug emerging from her ear. The game is half physical, half mental/social. Call it a sport and a pastime. (RIP, James Salter.) My friends and I, in fact, have a fantasy league for Survivor; we draft our teams before the show premiers, based solely on their photos and video teasers, and then earn or lose points based on events like losing a challenge, finding an immunity idol, or crying unnecessarily. The physical part isn’t just about performing in obstacle course-style challenges; it also means providing for the tribe back at camp. (We’ve seen many a big guy get kept around longer than he should simply because his tribemates knew that without him there wouldn’t be any fish to eat.) The mental part isn’t just about solving aggravating block puzzles but also calculating, constantly, which of your allies is telling the truth and which will turn on you the second they get the chance. The contestants are paranoid the entire time; by the end, they’re physically and emotionally exhausted and have usually lost around 20 pounds. This season, Culpepper has completely changed his persona from his first time playing. 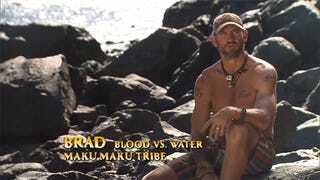 When he went on in 2013, it was for the first season of Blood vs. Water, a (good) gimmick the show did where every contestant was in a pair with a loved one who had played before. Culpepper went on with his wife Monica, who had been voted out fifth when she played in 2012. Brad got voted out sixth and then, weirdly, went around telling everyone he wasn’t mad at them. Monica, on the other hand, made it all the way until the final tribal—though she was accused of riding coattails—and even received one winning vote, but Tyson Apostol won the money. Well, the brand has worked. Big, strong men usually last at least until the merger, because their tribemates keep them around for their strength in challenges, but then are instantly targeted as threats. Brad has nimbly switched his alliances a couple of times, and hasn’t hesitated to link up with some radioactive types like Debbie, who is batshit. And often, yes, he has laid on the charm. In a casual conversation at camp about family members, Culpepper brought up his wife and then had a good cry, impressing the others with his (real or feigned, who knows) tenderness. (At the same time, Zeke, in an exit interview, said he and police officer Sarah Lacina “both liked to roll our eyes at Brad Culpepper’s stories.”) He has made family his personal theme; his son Rex is currently the starting quarterback at Syracuse and Brad has worn a Syracuse cap every day on the island. So if you feel like tuning in for the finale, it’s not too late. All you really need to know is that Culpepper, who transformed his social approach, is still hanging around, that it’s a surprise, and that he has a decent shot to be the first NFL-alum Survivor winner. But he’s up against an adorable Vietnamese gay man who has two unused immunity idols and made it to the final three the last time he played (Tai); a likable cop who has one unused idol (Sarah); a likable, nerdy social-media marketer from Newton, Mass. who has flown under the radar this season (Aubry); a Survivor “hero” and mom who has played four times and never won (Cirie); and a stick-thin, long-haired swimsuit photographer nicknamed “Troyzan,” who also has an immunity idol he can use. Culpepper has no immunity idols. If he’s going to make it to the end he has to do it his goddamn self. But even if he doesn’t win, he’s done more than enough to atop of the ranks of athletes on Survivor.